In late March, 1966, many of Australia’s best sailors were joined by 27 international competitors for the 505 world cup held at Brighton and Seacliff Yacht Club. The 505 class (reflecting its 5.05 metre length) originated in France in the 1950s. 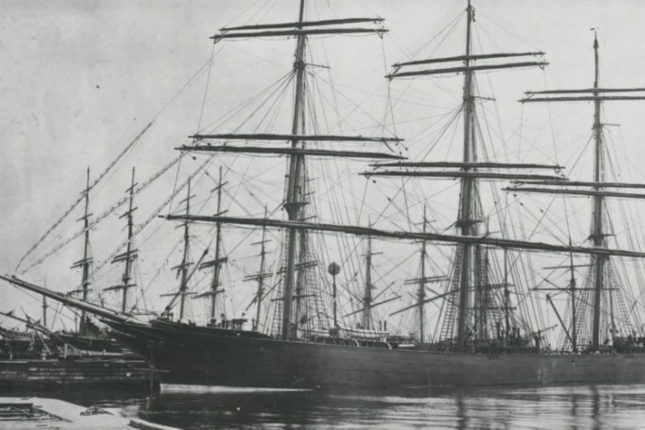 Among the competitors was the then 33-year-old South Australian Vigneron Sir James Hardy who was one of a group of sailors who introduced the class to South Australian racing. 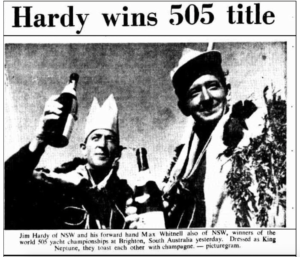 Hardy was sailing his 505 Black Bottle, named after a top shelf brandy produced by the famous family winery, and crewed by himself and Max Whitnall. 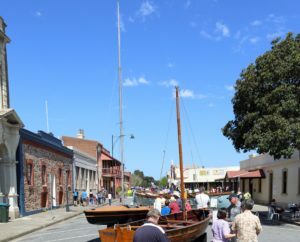 Black Bottle was build by renowned South Australian boat designer and builder, David Binks, who pioneered the use of fibreglass in the construction of racing yachts including the 505. Racing over a week, the best five results of each crew were counted. The first day of racing was very calm; Canberra Sailor Rod Dalgliesh delighted in the conditions ‘just like the old lake (Burley Griffin), light and fluky’. It wasn’t to last: on day two extremely strong winds cut the fleet by two thirds. Nichol’s trails had only just begun, though. After withdrawing from the race, a particularly strong wind gust lifter his yacht off a tailer and the mast became caught in some power lines, burning the stays and part of the mast. Conditions didn’t hamper Danish Olympic Gold medallist Paul Elvstrøm who won the first two hearts; for the remainder of the week, he and Hardy benefited from stronger winds. Hardy, who after a childhood sailing at Brighton Seacliff knee the local conditions well, posted strong results. Going into the final race, Hardy was just ahead of Elvstrøm on points, needing to finish second to secure the title. Characteristically, Elvstrøm won the start and led by nearly two minutes early in the race, whilst Hardy dropped back to 19th. 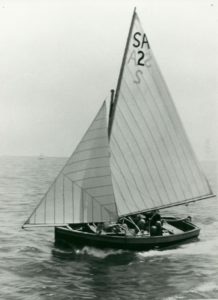 Moving through the fleet, Hardy eventually finished second, but only by a boat length ahead of fellow South Australian Bob Lanyon. 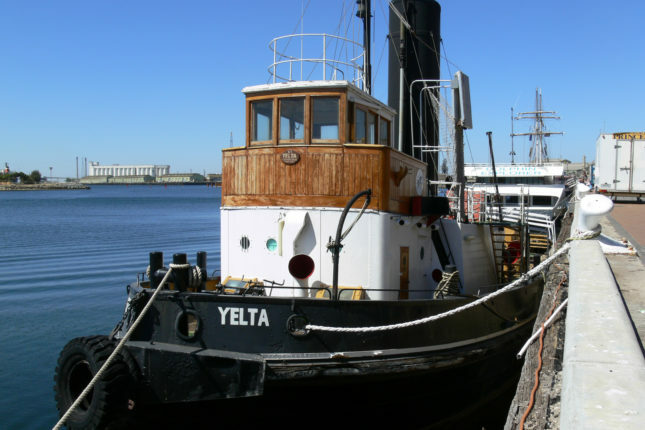 Sir James donated the Black Bottle along with his sharpie Tintara and his cadet dinghy Nocroo to the South Australian Maritime Museum in 1986. The museum also owns Noc-too, built by Sir James for Fred Neill, using the same plans as his own dinghy, Nocroo.